Can Cisco Systems' Juicy Dividends Get Any Better? 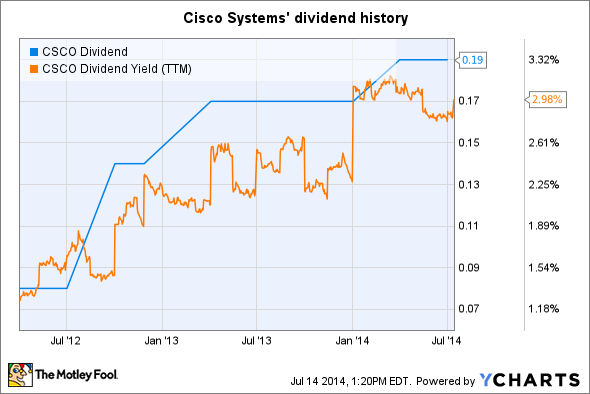 Cisco Systems delivers a dividend yield above the Dow Jones' generous average. The payouts have also risen quickly. How much longer can Cisco keep this one-two combo up? When Cisco Systems (NASDAQ:CSCO) started sending out dividend checks in 2011, the annual payout only added up to $0.32 per share. Yields hovered just above 1% per the first couple of years, well below the average dividend yields on the Dow Jones Industrial Average (DJINDICES:^DJI). 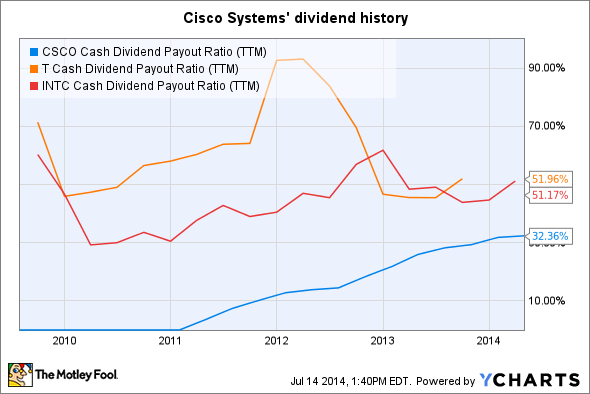 But Cisco has improved its dividend game. Today, Cisco is on pace to deliver annualized payouts of $0.76 per share, which works out to a 3.1% yield. That's an above-average yield even for the elite Dow club, and income investors are loving Cisco's commitment to regular (and large!) payout increases. But past performance is no guarantee of future returns. How much longer will Cisco be able to maintain this heady pace of dividend growth? 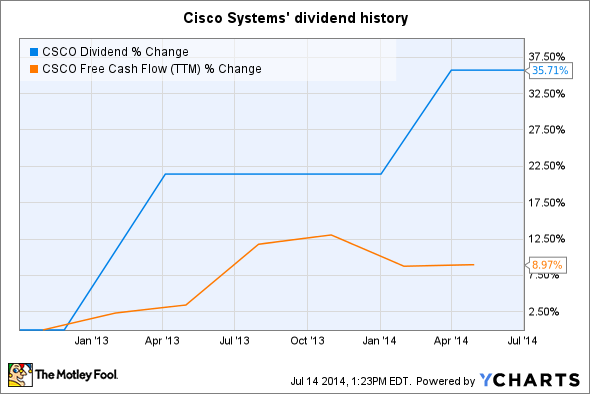 On the other hand, Cisco is pulling these dividend checks out of a generous cash-flow stream. Over the last 12 months, the company has funneled $3.7 billion of its $11.4 billion of free cash into dividend payments. That's a rather modest 37% cash payout ratio. This ratio compares favorably to other high-yielding Dow stocks. For example, AT&T must use 52% of its free cash flow to keep the Dow's highest dividend yield going. I personally own Intel at least partly for its dividend prowess, and that's with a 51% cash payout ratio. Cisco's headroom leaves both of these high-yielding Dow peers gasping for air. CSCO Cash Dividend Payout Ratio (TTM) data by YCharts. Moreover, the company spent $6 billion of its trailing cash flow on share buybacks. While share repurchases are often a sign of strong insider confidence in the company's future prospects, they aren't always the best use of spare cash. Redirecting some of these assets into even stronger dividends might not be a bad idea over the next few years. Finally, dividends get a fair amount of airtime in Cisco's quarterly earnings calls. In the most recent call, dividends were singled out as a central focus of Cisco's shareholder value creation. Management also promised to continue its "aggressive" buyback and dividend strategies going forward. In short, Cisco has a ton of headroom for further dividend growth -- and a plainspoken desire to keep the boosts coming. That's music to any dividend investor's ears.